This shot was taken beside the Aire and Calder Navigation south-west of the centre of Leeds, near the Thwaite's Mill industrial museum. The adult green shield bug ranges in the colour of their backs from bright green to bronze, without any substantial markings. 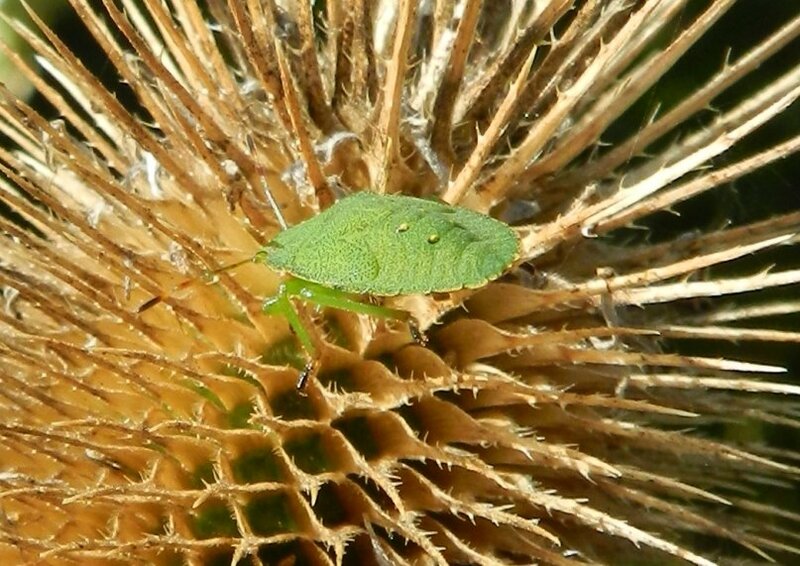 Green shield bugs are very common throughout Europe, and are found in a large variety of habitats, including gardens. The teasle is a common plant in the UK, either growing wild or as a feature plant in the garden. There are several varieties. It was once commonly used in the textile industry providing a natural comb for cleaning, aligning and raising the nap on fabrics, particularly wool, though by 1900 it was largely replaced by metal cards for that task. It is just over a year since a teasle last appeared in our project ( http://365project.org/fishers/365/2015-08-10 ). Nice - Tina likes them! Like the textures, good find and shot. Fabulous detail and brilliant composition. Love that bug. Looks so cute and so flat. A beautiful close up with great details and nice textures. Thank you all for your comments and favs, they are appreciated. It's always fascinating walking along canal towpaths, as we did here on our way from Leeds city centre to the Thwaite Mills museum, since they are such wildlife havens. Thank you for adding the link. now that I see the picture I remember it. the Green Shield Bug is new to me. looks quite interesting though. I missed the bug and only saw the leaf until I read further. Great shot.